This page provides information on the various ways that you can obtain up-to-date UK travel news on the move. We also look at some of the mapping solutions available, and some useful products and services to help get traffic information to you wherever you are. Trafficmaster online - Take a free month's trial of live traffic maps and personal alerts service - See Halfords for deals. If you're looking for up-to-date travel news over the Internet while driving, consider a TomTom One unit (now less than £150). This sat-nav unit connects to your Bluetooth mobile phone to get traffic data from the 'net, then re-routes you around the traffic problem. RailEasy - Save up to 80% compared with "on the day" tickets. Access to real-time road news by phone. Services use computerised voice technology to report on road conditions. We use o2's TrafficLine, which can identify which roads you're near from the mobile cellbase you're connected on. O2 customers: Call Trafficline on 1200 from their o2 mobile. Calls cost 45p per minute. Traffic data supplied by TrafficMaster. Advance warning - Some years back, it was possible to buy a small in-car unit to place on your car's dashboard. These picked up signals from the Trafficmaster sensors on motorways and some 'A' roads, and gave advance warning of upcoming slowdowns in traffic flow. It would give a countdown of 15, 10 and 5 miles before the slowdown, and an eggtimer icon to represent how serious the slowdown was. What it didn't give, was a reason for the holdup, which was when it was handy to call one of the dialup automated services. 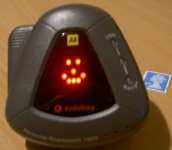 A more basic version, the 'Cellnet Traffic Line 1200', was also available. The are no longer in production either, but these frequently appear on eBay.co.uk for around the £5-£10 mark. Well worth obtaining! Road updates by text message - For less than 10p a day, AA Roadwatch Mobile service includes a daily text alert, email updates and wap access. Daily tube status: Register free online with Transport for London, and specify your regular journey details. You'll receive a text message in advance of your regular journey if one of your lines is affected. Register at alerts.tfl.gov.uk/index. Tube news on demand: You can send a text message to Transport for London on the following number: 07740 11 1234 for an automated tube status message. For details of the short codes, go to TFL SMS services. For help on text messaging, and for details of free text message services, see our SMS page. Another great source of travel news comes in the form of the travel reports found on local, regional and national radio. The most accurate of these for local traffic conditions tends to be local radio - In the UK, there are two main types of local radio station, BBC local radio, and a network of independent commercial radio stations. Local radio source their travel news in several ways, but most commonly, they'll make use of the services of one of the dedicated companies that provide voice and text reports to radio stations: Until recently, AA Roadwatch was probably the best known of the companies providing travel information, but changes announced in late 2004 means that their role is to be reduced (see Times News Story). This leaves Trafficlink as the prime source in the UK. TrafficLink rebranded to Inrix in 2012. Some stations have their own in-house travel staff as well (normally during peak hours only), to add a local voice to reports. Travel is gathered from various sources, including: local police, motorway control, rail companies, courier/taxi firms, listener "jamlines", and spotter planes. Most FM radio stations in the UK operate a system called RDS (Radio Data System), where small amounts of text and data are sent out with the radio signal. Radio receivers with RDS can display this information - most commonly an 8-digit radio station name, or the programme type (i.e. Pop, Rock, etc). A very useful bit of information sent, is something called the 'TA flag'. Standing for Traffic Announcement, this can be switched on when a radio station starts a travel report, and switched off at the end (some stations use three DTMF tones to trigger the TA flag). The practical upshot of this, is that your RDS radio can switch to a station carrying travel news, or in a car, pause a cassette or a CD, when local travel news is broadcast. Handheld RDS radios start from about £40, and many new cars come with an RDS radio as standard. RDS portable radios, such as the Roberts RD49 pictured here, plus hi-fi tuners with RDS, can be found at John Lewis. Using RDS: For more on using RDS, see the BBC RDS factsheet. For more information on RDS and local radio in the UK, see our sister site Radio and Telly. For the serious motorist, the PDA solution of choice is the excellent TomTom Navigator. This is advanced route planning uses GPS satellites to track your position, the software speaks your route, shows you a 3D map of your next turning, points out places of interest, and can warn you of upcoming speed and red light cameras. Use a plug-in CF card GPS receiver, or a Bluetooth unit on your dashboard, connected wirelessly to your Pocket PC. Version 3 of this excellent application also includes TomTom Traffic, a subscription service that makes use of a connection to your mobile phone to download travel news and update your route in real time to go around the holdup. If you already have a Pocket PC, this solution is cheaper than you think. See our summary on the amazing TomTom Navigator. 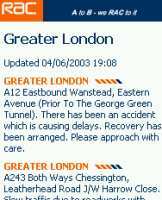 Traffic-i - Receive live road traffic information from the Trafficmaster network direct on your SonyEricsson P800, Sony Ericsson P800, P900, P910i, Nokia 6600, Nokia 3650, Nokia 7650, Siemens Sx1, O2 XDAII and Orange SPV E200 over GPRS. Find out about road issues in your area, plus get an indication of the speed of traffic on motorways and major A roads. If you have a Pocket PC or Palm OS handheld computer, chances are it's equipped with Avantgo. This little service connects to the Internet when you sync your PDA to your PC via the docking station, and can download content in a format that can be read by a browser on the handheld. In the office, we find this useful for TV listings and for traffic news supplied by the RAC. If you have Avantgo, sign up to the 'RAC Mobile' channel to download details of current road information and notifications of roadworks. It's only as up-to-date as the last time you performed a sync using HotSync (Palm) or ActiveSync (Pocket PC), but nonetheless, it's a great planning tool, and worth checking for advance notice of problems. This is the mother of all mapping programs for the PC. AutoRoute, provides truly bucketloads of information and features. Great for mapping a route, anywhere in Europe, door-to-door by postcodes, it can be set with your driving speeds, to avoid certain roads, go the scenic route, zoom in and out, print maps and a whole stack more. Amazingly detailed, with good step-by-step instructions for your navigator. AutoRoute 2011 is available from Amazon for £39 (cheaper than on the high street). It includes the whole of Europe, and identifies thousands of restaurants, hotels, petrol stations, car parks, cash machines, train stations and pubs across Europe. You can't have helped but notice the increase in the number of speed cameras... not only the fixed grey and yellow ones (known as Gatso), but the mobile units hiding around the corner where you least expect them. Obviously, breaking the speed limit is dangerous and illegal, but as cameras are supposed to be sited at blackspots, knowing where they are is a great benefit. Looking for a downloadable list of UK speed cameras? The best site we've come across is the PocketGPS Safety Camera Database. 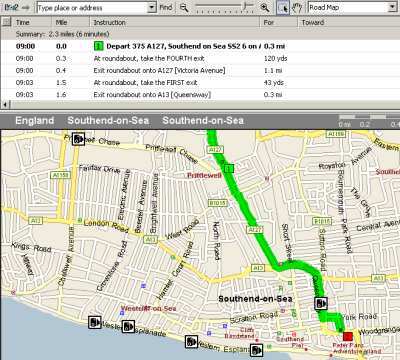 The database that they provide for free download is intended to be used with TomTom's Navigator application on a Pocket PC (see our Pocket PC Navigator page). If you don't have Navigator, the list can also be converted from the TomTom Navigator format into an ASC text file via a free application called POIManager (from the same site). This list can then be imported into AutoRoute (and exported to a Pocket PC if required). The database gives longitude and latitude co-ordinates for the cameras, which as you'll see from the screenshot to the right, is enough for a map program to work out where each camera is sited. If you're using TomTom Navigator, you can also use this database with the free application, CheckPOInt, that can alert you audibly of an upcoming camera. Speedcamerasuk camera database - Online database of cameras, by region and by town. Can't be downloaded onto a map, but very handy, regularly updated, and with useful directions and descriptions. The other option for being camera aware is to buy a speed camera detector - which is the best way to keep an eye on where the cameras have got to. Better than an online database, these small gadgets detect the radar signals from fixed and mobile speed cameras, as well as red light cameras and the mobile laser systems that the police are now using too. The boxes can be a little expensive, but could save you a fine, or your driving licence. If you have a mobile phone that's been on the market for the last couple of years, chances are, it has a built-in WAP browser. This means that you can connect to special 'mobile internet' pages from your mobile. On a Nokia, you'll find WAP under 'Services' in the menu. There are several WAP services available that may be of use. Your network operator's WAP homepage links to travel resources, for example O2 Active "Info/Travel" page and Orange's "Travel and Journey" channel. Billed as a Personal Travel Service, Kizoom has been around for a few years, and offers an exceptionally useful service for rail travellers. Create a free account with them via a web browser, and enter the details of your regular train journeys, plus the times of travel. Log in from your WAP phone with the address http://www.kizoom.mobi, and the system should know from your calendar where you are. You can then search for trains home, or to another destination. It can tell you how many changes you'll make on the journey, and your estimated arrival time. Transport for London is available on WAP phones via the address http://wap.tfl.gov.uk/ . If you live in,or commute to, London, add this to your bookmarks now. Essential for real-time tube information, and occasionally more up-to-date than the information displayed at tube stations. Getting travel information to your mobile phone over WAP is a very useful way to check for problems. Pictured here is a screenshot of the Transport For London real-time tube information. Frustratingly, WAP offers only a fraction of the content that's available by a standard web browser, and unless your rail company has a dedicated WAP site, you might not be able to get access to local information about your train journey from your mobile. Help is at hand thanks to Google, the web search experts. Enter the address http://www.google.com/ into your phone's WAP browser, and you'll be prompted for something to search for. This service searches the web (not just WAP sites), and converts the results to pages that can be viewed on a WAP page. The screenshot demonstrates how rail company c2c's website looks on a tiny mobile phone screen. OK, so you have to squint, and scroll down the page a bit to find what you're looking for, but you can bookmark pages that you visit frequently for fast recall. Works a treat for us! Orange mobile customers can access road and rail travel information via the Travel channel on Orange World. They also offer the TrafficTV download that works on most modern phones, it shows delays across the UK and allows you to look at CCTV pictures. For help on WAP, see our WAP page. MiniGPS / Where I Am - Small application for the Nokia 6600 and other Symbian OS smartphones that lets you know where you are, based on your nearest mobile phone cellbase. When you enter a certain cell, you can get the application to do clever things - such as let someone know by text message that you've arrived safely, or making sure that you don't miss your station by getting this app to wake you when you're nearly home.